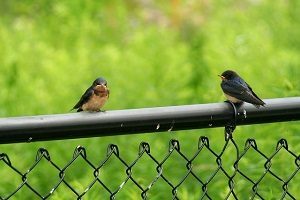 Think about replacing your chain link fences with these other choices. If you have a chain link fence, then you know it has many benefits. But given enough time, you might come to find that it no longer serves the same purpose it once did. Or, you just don’t want it anymore. That’s okay! Think about replacing your chain link fences with these other choices. The wooden fence is simple and classy. It’s a classic fence style for a reason. You can use it to increase the privacy around your home. When you build it to the right height, a wooden fence can block out noise from the neighborhood, which you can’t really do with chain link fences. You can also use wood to build a split rail fence. Plus, pressure-treated or natural hardwood are great choices, since they can stand the worst winter weather Virginia can throw at them. On the other hand, you might want to try out an aluminum fence instead. Aluminum can help deter intruders, and best of all, it’s easy to pick up and move, which makes installation a snap. If you’re worried about how rust will ruin a metal fence, that’s a not a problem with aluminum, since it will resist the effects of corrosion. Chain link fences are similar to aluminum fences in that they’re lightweight and easy to set up, but aesthetically speaking, chain link just isn’t as pleasing to the eye. Finally, you might also want to consider vinyl fences as replacements for chain link fences. First of all, vinyl won’t rust. It can’t warp or change color, either. Plus, insects can’t eat the way through it, and the vinyl won’t start to rot after it has been wet for too long. You can experiment with different styles and colors until you find the vinyl fence that suits you and more importantly, suits your yard. The choice is yours – don’t wait until spring comes back to make a change. This entry was posted on Friday, February 1st, 2019 at 3:45 pm. Both comments and pings are currently closed.